Jazz fans have never exactly wanted for live albums. If you’re a fan of the genre and have any kind of collection, it likely contains stacks of field recordings. 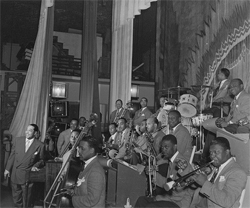 There seems to be a maxim for rock ’n’ roll fans that every top act produces one legit live classic, but you could pick up a second job and still not make much headway into rounding up the full live catalogs of jazz heavy hitters such as Miles Davis, Charlie Parker, John Coltrane, and Duke Ellington. These guys recorded everywhere and seemingly in every which way — at small clubs by running lines to equipment set up in the kitchen; on radio broadcasts at surf ’n; turf joints, festivals, and, in the case of Albert Ayler’s sending off tenor hero Coltrane, funerals. But what you don’t get a lot of is honest-to-goodness big band one-nighters in the middle of nowhere.